gives the integer closest to x.
rounds to the nearest multiple of a. 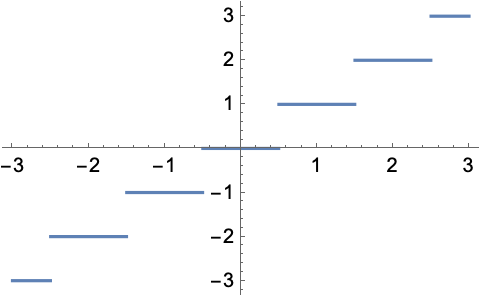 Round rounds numbers of the form x .5 toward the nearest even integer. Round[x] returns an integer when x is any numeric quantity, whether or not it is an explicit number. For exact numeric quantities, Round internally uses numerical approximations to establish its result. This process can be affected by the setting of the global variable $MaxExtraPrecision. Round applies separately to real and imaginary parts of complex numbers. Round automatically threads over lists.